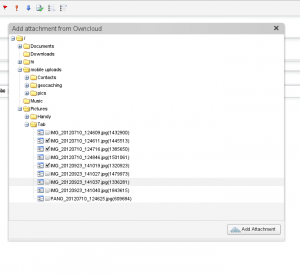 I have extended the plugin so that you can instantly upload a received attachment to owncloud. This is very usefull for saving documents or pictures in your personal cloud. You can choose a destination diretory for your attachment, or simply create a new one. For this plugin you need an owncloud server running version 4.5 or higher. All server and usersettings can be edited in the special owncloud settings context. You can enable or disable parts of the plugin so that everything fits your needs. And you have to setup the connection to your owncloud server. Therefore you have to enter the hostname, most likely a top-level domain and the path to your owncloud installation / the webdav connector. If you have installed owncloud in your webroot this would be /files/webdav.php . Then simply enter your owncloud username and password and you will have access to all your files. I have planned a complete integration of the owncloud web-interface to zarafa, so that the original owncloud webinterface will become unnecessary. So stay tuned for further updates! Fixed some problems with older PHP versions. Now also works with WebApp 1.2.2, 1.3beta! Please send me feedback so that I can improve the plugin!